There are two types of people – those who are irritated by supermarket Five items or less signs (Fewer! It should be FEWER!) and those who don’t know the difference. Do you know the super simple tip to tell them apart? So there you go. If you can count it, use FEWER. 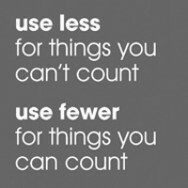 If you can’t, use LESS. More tips = fewer mistakes + less confusion. Once you know that things you can count are called ‘count nouns’ and things you can’t count are called ‘mass nouns’ you can apply the same logic to MANY and MUCH. Use MANY for things you can count, and MUCH for things you can’t. Using too many words can confuse your message. Too much confusion can prevent customers from choosing your business. For more grammar and writing tips, check out my Facebook page or follow me on Twitter.